VIMIERA Village Eastwood resident Johanna Binkhorst chalked up a milestone earlier this year when she celebrated her 100th birthday. 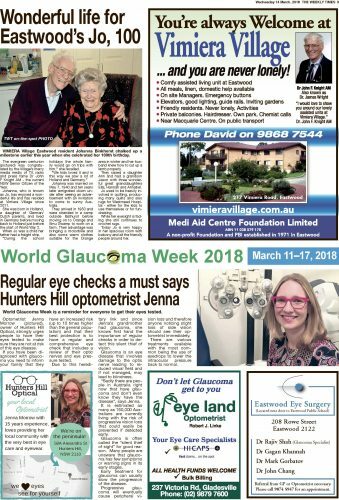 The evergreen centurion was congratulated by the Village’s merry media medic of TV, radio and press fame Dr John F Knight AM – the current NSW Senior Citizen of the Year. Johanna, who is known as Jo, has enjoyed a wonderful life and has resided at Vimiera Village since 2011. She was born in Holland, a daughter of German/Dutch parents, and lived in Germany before moving back to Holland just before the start of World War 2. When Jo was a child her father had a freight ship. “During the school holidays the whole family would go on trips with him,” she recalled. 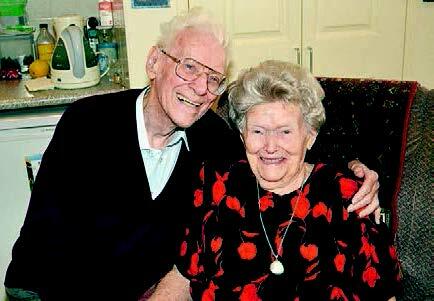 Johanna was married on May 7, 1940 and ten years later emigrated down under after seeing an advertisement with an invitation to come to sunny Australia. They arrived in 1950 and were stranded in a camp outside Bathurst before moving on to Orange and Emu Swamp to work on a farm. Their advantage was bringing a motorbike and also some warm clothes suitable for the Orange area in winter and her husband knew how to cut up a lamb properly. They raised a daughter Ann and had a grandson Jason with three wonderful great granddaughters Ella, Hannah and Annabel. Jo used to be heavily involved in quilting, producing many quilts and also rugs for Westmead Hospital – either for the kids to use themselves or for fundraising. While her eyesight is fading she still continues to crochet rugs. Today Jo is very happy in her spacious room with balcony and all the friendly people around her.